BURKE, Edward Raymond, a Representative and a Senator from Nebraska; born at Running Water, Bon Homme County, S.Dak., November 28, 1880; moved with his parents to Sparta, Monroe County, Wis., in 1880; educated in the public schools of Sparta, Wis.; moved to Beloit, Rock County, in 1902; graduated from Beloit (Wis.) College in 1906; taught school in Chadron, Nebr. 1906-1908; graduated from the law department of Harvard University in 1911; admitted to the bar the same year and commenced practice in Omaha, Nebr. ; during the First World War enlisted and was commissioned a second lieutenant in the Air Service 1917-1919; president of the board of education of Omaha 1927-1930; elected as a Democrat to the Seventy-third Congress (March 4, 1933-January 3, 1935); did not seek renomination in 1934, having become a candidate for United States Senator; elected to the United States Senate in 1934 and served from January 3, 1935, to January 3, 1941; unsuccessful candidate for renomination in 1940; chairman, Committee on Claims (Seventy-sixth Congress); resumed the practice of law in Omaha, Nebr. 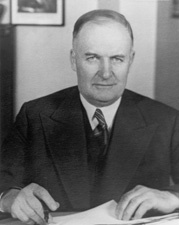 ; moved to Washington, D.C., in 1942 and served as president of Southern Coal Producers Association until 1947; Washington representative and general counsel for Hawaiian Statehood Commission until 1950; retired and resided in Kensington, Md., until his death there on November 4, 1968; interment in Fort Lincoln Mausoleum.